If you’ve used OS X for a while, you may have seen the CDs & DVDs System Preferences panel before. 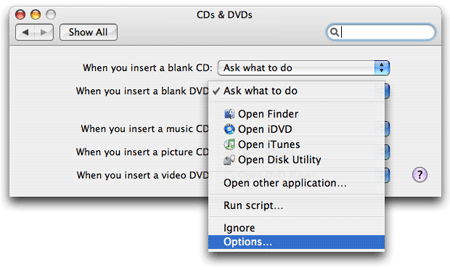 This is where you tell OS X what to do when you insert a blank CD, a blank DVD, a music CD, a picture CD, or a movie DVD. Using a pop-up menu next to each media type, you can, for example, tell the system to launch iTunes when you insert a blank CD, or to open iPhoto when you insert a picture CD. On the other hand, since OS X’s default settings for each media type are pretty good, you may not have ventured into this preferences panel before. In either case, this tip may make it worth your while to visit the CDs & DVDs panel. That’s right; using the hidden Options menu, you can have any of the specified actions for any of the media types performed when you login. Now, for many media types, checking this box won’t do a lot of good. For instance, “asking what to do” when inserting a blank CD “at login” would mean that if you logged in with a blank CD in the drive, you’d be asked what you’d like to do with the blank CD. Not terribly useful, as you’ve probably got the blank in there for a reason. However, for music and picture CDs and video DVDs, the ‘Perform action at login’ setting makes more sense. Want your PowerBook to automatically start playing the movie DVD (or the music CD) that’s in the drive when you login? With the video DVD (or music CD) pop-up set to Open DVD Player (or Open iTunes), hold down the Option key, click the pop-up again, choose Options, and check the ‘Perform action at login’ box. From now on, if you’ve got a DVD movie (or music CD) in the drive when you login, DVD Player (iTunes) will launch and you can start enjoying your media files immediately. You may not want to use this hidden setting all of the time, nor on all of the various media types, but isn’t it nice to know that it is available?